Here’s a hot-take kind of question: Who was the better hitter in 2018, Giancarlo Stanton or Daniel Descalso? Stanton, the highest-profile acquisition of the previous offseason, was very good for the Yankees: 38 homers, .852 OPS and a 127 wRC+, meaning he was 27 percent better than the league’s average hitter. He was on a couple of MVP ballots. Descalso, paid $2 million after the Diamondbacks picked up his option in November, was pretty good, too: 13 homers and a .789 OPS, with a 111 wRC+. So that was easy. Stanton hit better, assuming the point of hitting is to get on base and hit the ball far. But, of course, it’s not. The point is to score runs, and for scoring runs, some hits are worth more than others. Descalso hit .270/.372/.541 with men on base, while Stanton hit only .236/.315/.429. Descalso drove in 17 percent of the men who were on base when he came up, while Stanton drove in only 14 percent. Of course, Stanton drove himself in 38 times, 25 more times than Descalso did — but now the question is close. By RE24, a stat that also credits a batter with the runners he advances with his hits, it’s a virtual tie. That’s assuming, at least, that the point of hitting is, rather than “get hits,” to create runs. 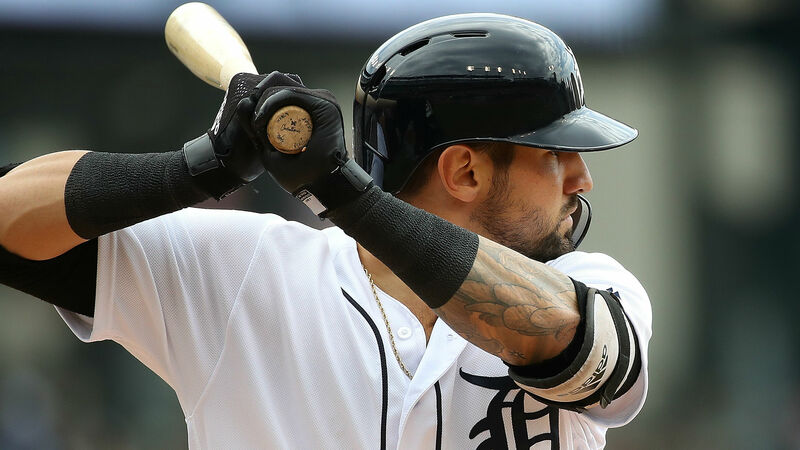 When it wraps up next month, the 2018 season almost certainly will have been the best of Nicholas Castellanos’ six-year career. The twenty-six-year-old already was positioned to take on an increased leadership role entering this season, and that responsibility has fallen even more squarely on his shoulders following a season-ending injury to Miguel Cabrera in June. Castellanos is younger than many of his newer teammates, including Niko Goodrum, Mikie Mahtook, and Ronny Rodriguez, but no one– with the exceptions of Victor Martinez and Jose Iglesias (by less than a month)– on the Detroit Tigers’ current forty-man roster has a longer major-league tenure with the Tigers than Castellanos. With Cabrera out and Martinez fading into retirement (but see), Castellanos is what qualifies as this team’s veteran leader. And yes, I realize he won’t even hit arbitration until next year. Last week’s Zach Britton trade reminded me about the idea of championship win probability added (cWPA). In 2016, Ben Lindbergh made the case that Britton, then serving as the closer for the Baltimore Orioles, should win the award for the most valuable player in the American League based on the idea that Britton, at least during the regular season, had done more to help his team win the World Series than any other player had helped his own team win the championship. Britton– again, a relief pitcher who threw sixty-seven innings– finished eleventh in MVP voting. Mike Trout, the WAR leader, claimed the award, his second, and I don’t suspect many people have thought much about cWPA since then. What should make cWPA (defined: cWPA “takes individual game win probability added (WPA) and increases the scope from winning a game to winning the World Series. Where a player’s WPA is the number of percentage points that player increased or decreased their team’s probability of winning a single game, their cWPA is the number of percentage points the player increased or decreased their team’s chances of winning the World Series.”) attractive to a broad swath of the MVP electorate is that it accounts for the traditional notion that the individual award-winner ought to have been on a winning team. When handing out performance awards for a given season, it makes sense to reward players based on what they actually accomplished, as opposed to what they should have accomplished but for bad luck, sequencing, weak teammates, strong opponents, environmental variations, and other contextual and extrinsic factors. After all, these factors work, to some extent, on all players, and just as we determine team season standings based on actual win percentage (and not a sabermetrically adjusted winning percentage), so too should we determine individual season awards based on actual results. This is not to say that the MVP should go to the player with the best batting average or the Cy Young to the hurler with the most pitcher wins, obviously. While using cWPA as a guide will steer us toward players who are, in the conventional sense, winners, it uses accepted sabermetric principles to maneuver in that direction. Still, I think there may be some concern that cWPA, when used alone as a player-valuation measure, might be too context-dependent and inclined to reward disproportionately an otherwise unremarkable player who happened to find himself in one or two of the right places at one or two of the right times. Certainly, though, it seems likely that a player who accumulated performances in those situations often enough to find himself near the top of the cWPA leaderboard also would be a well-rounded and highly productive player in all situations. Still, I was curious how well cWPA correlated with WAR, something it ought to do reasonably well if it’s to be available as a useful informant for MVP voters. 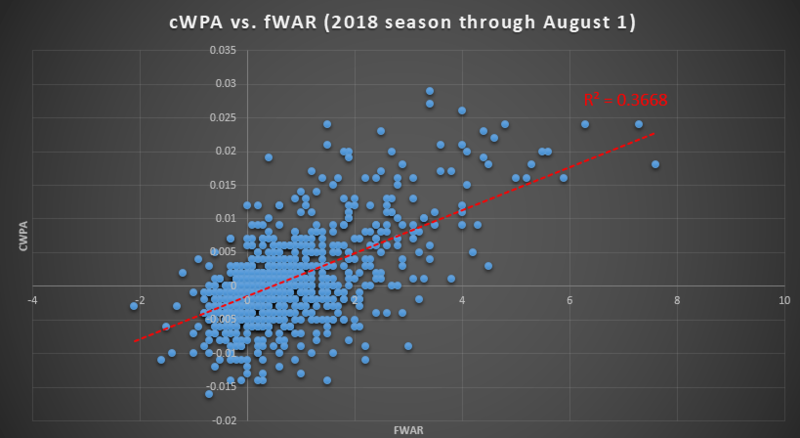 I pulled the cWPA numbers for the current season and used FanGraphs’ version of WAR mainly because their combined WAR leaderboard made data manipulation easier. There is a lot of significant, championship-relevant baseball yet to be played in 2018, and a more significant study of the above would have involved prior, completed seasons, but I think there’s something here and wanted to share what I had compiled on the current season as it moves into August and teams begin their playoff charges in earnest. I anticipate updating this information after the conclusion of the regular season and supplementing it with historical data to create an even more robust analysis. In the meantime, I welcome any input on win probability added and seasonal awards. When the Phillies traded Cole Hamels to the Rangers in 2015, it felt like a big deal. Texas was in the playoff hunt, and Hamels went 7-1 in twelve starts for them down the stretch. The return for Hamels (plus Jake Diekman) was voluminous in that it was comprised of six players. If you squint or are a dedicated Phillies or Rangers fan you might recognize a couple of those names. Last night, the Rangers, decidedly not a contender just three years later, chose to ship Hamels up to the Cubs. The teams have not officially confirmed the deal, but reports indicate that the return includes minor-league pitcher Rollie Lacy, a second pitcher who is “not a prospect,” [UPDATE: Eddie Butler, a pitcher who’s split time between the majors and Triple-A for the past four or so seasons; cash considerations also provided] and a player to be named (even) later. What are the Cubs getting in the oft-heralded Hamels? In short, a starting pitcher in decline. Hamels had an excellent run with Philadelphia, but he’s been something a little less than excellent since. His 2017 (4.20 ERA, 4.59 FIP, 5.47 DRA) was his worst MLB season to that point (0.2 WARP), and he’s been even worse in 2018 (4.72 ERA, 5.22 FIP, 6.26 DRA, -0.2 WARP). As news of the Hamels trade was breaking last night, some people contended that things would be better for Hamels in Chicago because Wrigley Field’s friendly confines are friendlier to pitchers than the Rangers’ home in Globe Life Park. There’s not nothing to that idea: offense played up in Arlington more than anywhere else in 2018. Wrigley hasn’t exactly been a run suppressor, though, as it too favors hitters. Hamels may see some comparative venue-based benefit as he moves north, but it likely will be negligible over a couple months. (One possible estimation of the magnitude of the difference is the difference between his FIP (5.20 on FanGraphs) and xFIP (4.18) in light of the slightly wider spread between Globe Life and Wrigley looking just at home runs, though Wrigley still is playing hitter-friendly in that regard.) 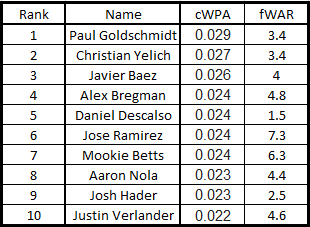 And, of course, metrics like DRA and WARP (which, for pitchers, is based on DRA) already account for park factors. Another thing I noticed last night as news of this transaction began to leak out was that Hamels is allowing a 23.2% line-drive rate, almost 4.5% over last season and a career high. That isn’t something that is park-specific, nor is it something for which Hamels really can share responsibility with his teammates. Hitters are squaring him up this year. The MLB season currently still sort of is on a break for All Star festivities, which makes this as good a time as many to check in on the status of my preseason predictions. What follows here is a significantly less-detailed look at 2018 team composition and production as of today, the first day of the All-Star break and the artificial halfway point of the season. Teams have not all played the exact same number of games to this point, but the game totals are sufficiently close for a coarse-grained “analysis” like the one I’ve conducted today, which isn’t analysis so much as making a graph for you to view while there isn’t real baseball for you to view. The rosters of the Blue Jays, Padres, and White Sox include none of the top-100 players of the 2018 season, and those teams have bad records. The Astros have the most top-100 players, and they have a good record. 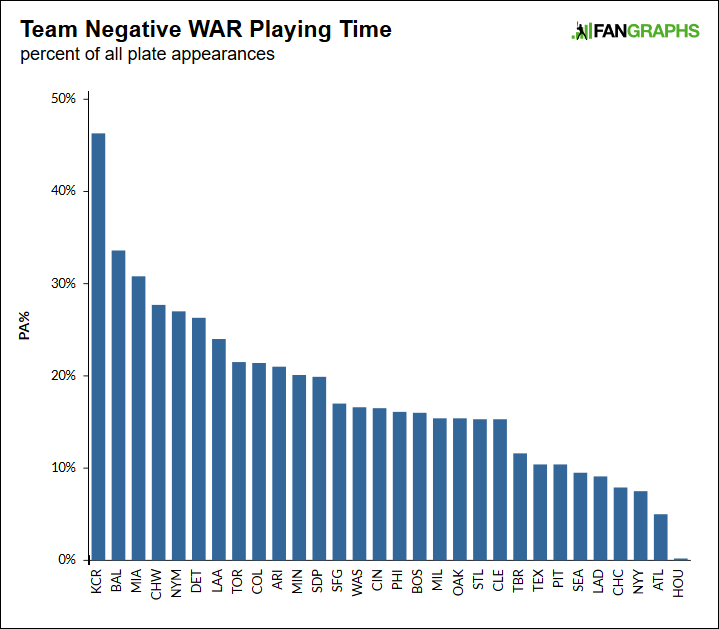 The Mets have four of the top-100 players– Jacob deGrom, Brandon Nimmo, Asdrubal Cabrera, and Noah Syndergaard– but a bad record– just thirty-nine wins– reflective of the fact that what remains is not merely mediocre but bad (check that negative-WAR graph above). Oakland maybe isn’t going to keep winning at a .567 rate in the second half. I don’t know if this graph tells you anything you don’t know. I don’t know if it tells you much at all beyond the data it contains, which is quite simple. But, if it speaks to you, let me know. The Home Run Derby is tonight at 8:00 on ESPN. The All-Star Game is tomorrow night at 7:30 on FOX.